Long Beach, Calif. – June 6, 2015 – Formula DRIFT presented by GoPro entered Orlando Speed World for the first time for Round 3: Unchartered Territory. Ryan Tuerck in the Retaks / Maxxis Scion FR-S takes the event victory and moves into second place in the standings. Round 3: Unchartered Territory lived up to its moniker as the Series entered Orlando Speed World for the first time. 637,000 viewers tuned into the Driftstream during the weekend and were not disappointed. Despite the inclement weather, the action on track was very competitive. The new track would prove to be challenging even for the most seasoned of veterans. The event was full of upsets and surprises. The semi-finals was a rematch from the last event with defending champion, Chris Forsberg in the NOS Energy Drink / Hankook Tire Nissan 370Z and Ken Gushi in the GReddy Racing / Hankook Tire Scion Racing FR-S going head to head. On Forsberg’s lead run contact was made that was ruled to be Gushi’s fault giving him a zero. During the same run, but unrelated to the cars’ contact, Forsberg’s vehicle caught on fire which forced Forsberg to utilize his fire suppression system. That then led to his car being non-operational from that point forward. 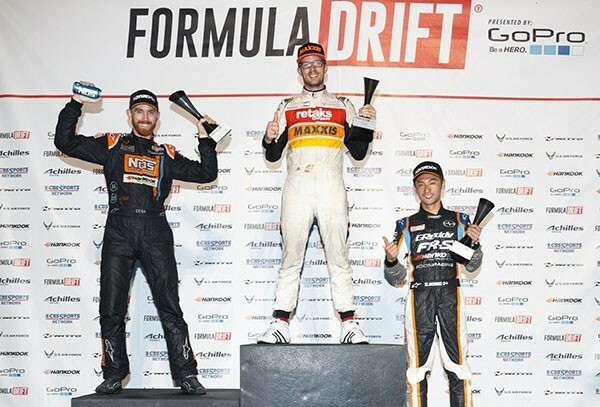 Forsberg was awarded the win over Gushi and was set to meet Tuerck in the Finals, but unable to continue through the competition due to the complications with his car, Forsberg was forced to bow out giving Tuerck the victory to move him into second place in the standings. Gushi moves up to fourth place and Forsberg into third place overall while securing both their second consecutive podium finishes.